I was very excited to receive my order of the SALT stylus tip, a new interchangeable tip for the Caduceus Stylus , made by iFaraday. 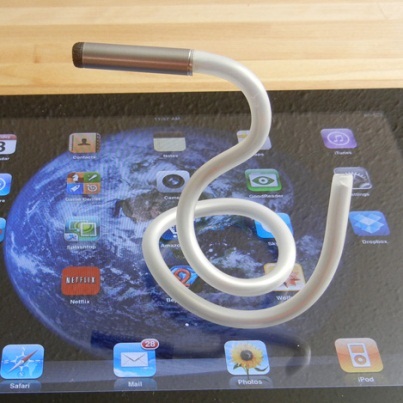 The Caduceus Stylus is an appealing stylus featuring a bendable shaft and very light making it well suited for individuals with grasp and motor control challenges. Made with a flexible core (but yet rigid enough to maintain positioning when used) and plastic coating, this stylus can be bent to almost any configuration. Total length of the Caduceus is 15″. It weighs 20 grams, so light you can hardly feel this stylus when applied. 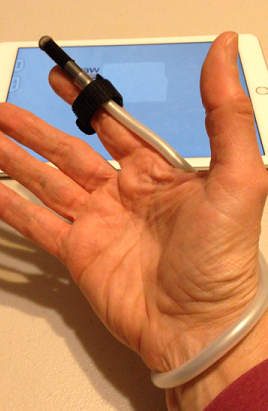 Prior trials of the Caduceus stylus with its original flat, found activation was very challenging for the clients I trialed. The tip of the Caduceus had to be vertical to the surface and directly on the target for activation. Although a great concept, use was frustrating and effortful with the clients trialed due to the difficulty with the specific contact required for activation on a capacitive screen. iFaraday now offers an alternative tip, the SALT tip, which offers a highly sensitive tip resulting in easy activation from many angles with minimal pressure. 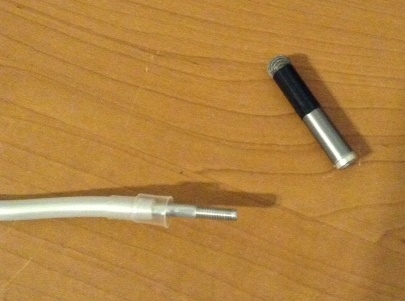 After purchasing the SALT tip it was easily exchanged with unscrewing and screwing the original and new SALT tips (SALT tip below has the rounded tip). Trials of the Caduceus stylus with SALT tip with iOS visual motor apps found the stylus sensitive, accurate and easy to use. With recent interest in a finger stylus, I added a Velcro strap to secure the stylus to my index finger which allowed me to see the screens contents when drawing. 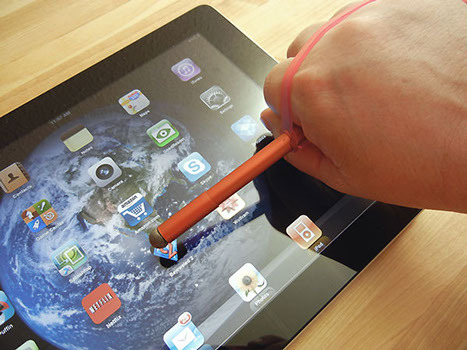 Repositioning the stylus can easily be done for ease of viewing contents or placement on a finger. Other modifications that might be necessary if tone interferes with positioning of fingers might include using a magic glove with the index finger cut out to reduce accidental touches of the hand or fingers. Positioning of the tablet also may be helpful. With the addition of the SALT tip, the Caduceus stylus can be adapted for many clients with motor challenges. Just using the SALT tip as a finger stylus might work! 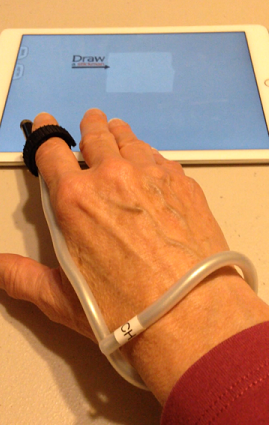 This entry was posted in Accessibility, Accessories, Assistive Technology, iPad, iPhone, iPod, Occupational Therapy, Physical Disability Tool, Rehabilitation, Stylus and tagged Accessibility, accessories, iPad, iPad accessories, Stylus, Visual motor apps. Bookmark the permalink. Thank you thank you Carol! I love your posts!! It seems like every time I’m looking for something I need to service my kids or a solution to an issue boom like magic I get a “Carol OT with apps email”!! I cannot tell you how many times you have had the exact answer I was looking for literally within seconds!!! This happened twice this week alone! Almost to the point of being scary!!! Lol Thank you so much for your research, hard work and dedication to our profession! You save full time working moms like me so much valuable time!!! I am a BIG FAN! Lauren, How kind of you to take your time to comment. I appreciate your positive feedback and your visits to OT’s with Apps. I frequently consider ending the blog due to time and the cost. Comments like yours keep me going! I’m hoping to find the caduceus stylus with salt tip. It appears that ifaraday is gone. Do you know of another source for that stylus setup? I’m hoping to find a solution to help my mother who has lost most use of her hands from ALS. I apologize for the delay. The Caduceus is still available. I created a post within the past month about styluses. Search again for ifaraday on the internet. I was pleased to find they still are making their one of a kind stylus!